The Student Health Center offers a variety of immunizations for travel and to help prevent diseases which might interfere with your academic program or impact your overall health. Meningitis is an infection of the membranes and fluid which surround the brain and spinal cord. Various organisms can cause meningitis, including several bacteria (treated with antibiotics) and viruses, occasionally other organisms. A family of bacteria called meningococcus is especially severe, and famously can cause outbreaks of disease in young adults living in close quarters, such as residence halls, barracks, prisons, etc. In the past, most outbreaks were caused by Type A or E meningococcus. Menactra, which protects against meningococcus A and C, is available and is recommended by infectious disease experts for prevention of meningococcus in college students entering residence halls. In the last few years, however, outbreaks of meningococcal meningitis on college campuses have been due to Type B meningococcus, which is not contained in the Menactra vaccine. Two new vaccines which do offer meningococcus B protection have recently been approved for use, although recommendations do not yet exist that they be routinely given to college students. At HSU, we offer the meningitis B vaccine, Bexsero, on an individual basis. We can order one dose at a time for students interested in getting it (it's a series of two shots a month apart), though it is expensive ($120/shot). Let us know if you want to get Bexsero, with or without Menactra. 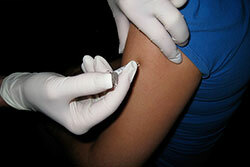 Some vaccines may be available for individual ordering, such as Meningococcus B or Rabies. Please inquire at the Health Center. If you are an HSU student who is required to have a TB test as part of your employment or program, or otherwise suspect that you need testing, we can accommodate you if you come in during designated “TB testing” hours (on our website and posted on the Health Center front door). Testing for TB exposure can be done in one of two ways, depending on availability, cost and other factors: by TB Skin Test (TBST), or by a blood test known as an IGRA test (one form of IGRA is known as “Quantiferon Gold”). The TBST is the cheapest and best known, though not the most accurate. When a TBST is performed, a small amount of liquid containing bits of the TB germ is injected just under the skin; the person being tested then returns to have the test “read” 48 to 72 hours later. At the Student Health Center, your Student financial account will be charged $10 for the TB Skin Test. The “Quantiferon Gold” blood test can be ordered by a provider at the Student Health Center, but you would need to go to one of the local hospitals to have the test performed. If you’re not sure which test you need, come in and discuss it with our staff. Directions to Rite Aid Mckinleyville. Immunizations are done on Tuesdays and Wednesday. If you have insurance you may be able to get recommended vaccinations through retail pharmacies at no cost. If done at the Student Health Center, you will be charged a fee as we do not bill insurance.